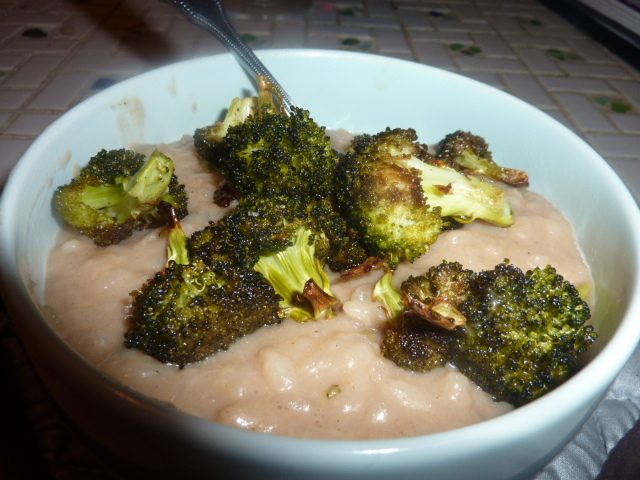 This creamy risotto was colorful, flavorful, and full of good-for-you vegetables. The lemon flavor was very pronounced and brightened up the whole dish to transform this risotto to a summer-appropriate dish. I adapted this recipe from Cooking Light, swapping out several of the vegetables in the original recipe for what I had on hand and was freshest. 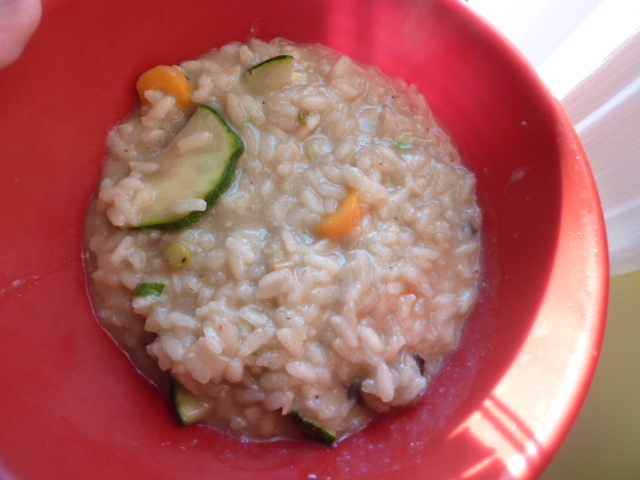 I was very impressed with the variation in texture from the slightly crisp carrots to the ultra-creamy Arborio rice. The real tricks here are almost constantly stirring the risotto to release the starch of the rice, never allowing the rice to become overly dry or overly soupy, and adding the butter and cheese at the end for a creamy finish. Bring chicken stock to a simmer in a medium saucepan. Cover and reduce heat to low. Heat a 10″ cast iron skillet over medium-high heat. Add olive oil to pan and heat. Add zucchini, carrot, mushrooms and whites and light green parts of green onion. Cook for 5-7 minutes until lightly browned, stirring occasionally. Add garlic and cook until just fragrant, about 10-15 seconds. Use a slotted spoon to remove vegetables from heat. Set aside. If necessary, add another splash of olive oil to the same cast iron skillet in which vegetables were cooked over medium heat. Add rice and cook for 2-4 minutes until very slightly golden brown. Add 1/4 cup of chicken stock and cook, stirring constantly, until liquid is absorbed, about 30 seconds. Stir in another cup of broth. Cook 5-7 minutes until liquid is nearly absorbed, stirring almost constantly. Reserving at least 1/4 cup broth, add remaining broth 1 cup at a time, stirring almost constantly. Wait until each portion of broth is nearly absorbed before adding next batch. Stir in the vegetables. Cook 2-3 minutes until thoroughly heated. Remove from heat and stir in 1/4 cup of broth, cheese, lemon zest, lemon juice, greens from green onions and butter. Taste for seasonings and season with kosher salt and freshly cracked black pepper as necessary. Zak and I are both big fans of risotto. Yes, the process is fairly labor intensive. Despite that, the final result is well worth standing in front of your stove for forty minutes or so stirring. I usually stand at the stove with a book and stir when the whim strikes me. The frequent or constant stirring of the risotto helps to release the starches in the arborio rice, which is what gives risotto the creamy texture that distinguishes from other varietals of rice. 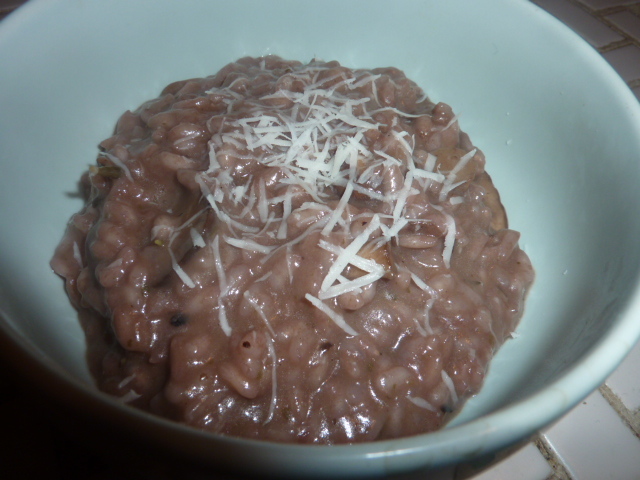 This particular risotto is decadently creamy and delicious. To be fair, though, I haven’t met a risotto I didn’t like, and ingredients can easily be substituted based on what you have on hand. I recommend, however, that you use a good stock while making risotto rather than something boxed or simple water. 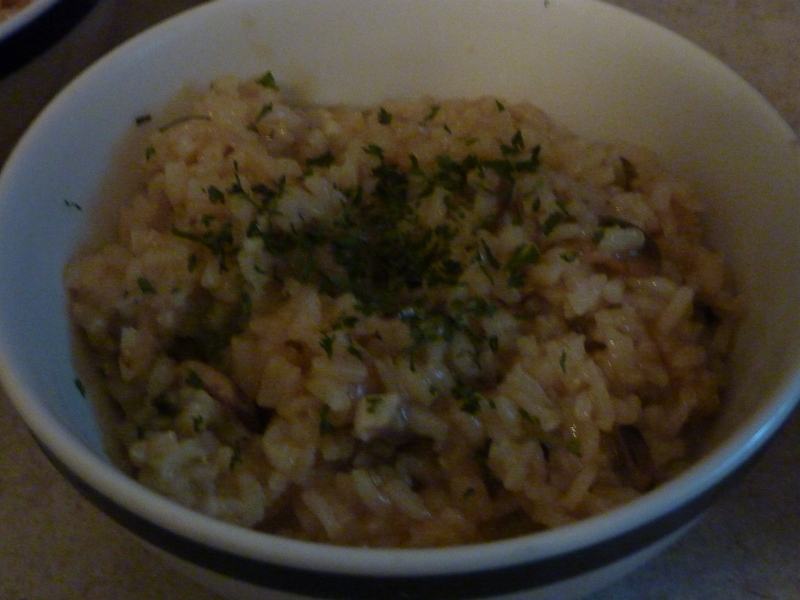 The rice really draws in the flavor of the stock, and without a decent stock base, the recipe will fall flat. Combine homemade chicken stock and basil in a medium stock pot or sauce pan. Cover and bring to a low simmer. Meanwhile, in a large sauté pan or skillet, heat olive oil over medium heat. Add sliced shallots, mushrooms and garlic and sauté until mushrooms and garlic are a light golden brown and shallots are slightly caramelized, roughly 10 minutes. Add arborio rice and sauté until lightly golden brown. Add white wine to pan, stirring, and simmer until wine is absorbed. Slowly, one cup at a time, add the simmering stock. Stir frequently. As each cup of stock is completely or nearly completely absorbed, add another cup of stock, continuing to stir. Cook, slowly adding stock and frequently stirring, until rice is al dente or to taste. This will take roughly 25-35 minutes. Once final cup of stock is almost totally absorbed, stir in grated Jarlsberg cheese and butter. Combine thoroughly and serve with dried parsley as garnish.